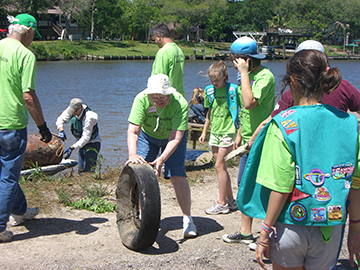 The annual river cleanup will be held on Saturday, April 30, 2011, 9:00 a.m. – 2:00 p.m. F.O.R. is dedicated to ensuring a clean, healthy, flowing San Bernard River. Anyone who volunteers is asked to bring their boat if available, or if not, then help at one of the collection sites at McNeill Bridge boat ramp on FM 521, Churchill bridge boat ramp on FM 261l, River’s End boat ramp on FM 2918 and at Hanson Riverside County Park, Hwy 35. Bring a hat, bug spray, sunscreen and gloves. Free t-shirts, water and trash bags will be provided. Immediately following the cleanup, volunteers are invited to a free hot dog social at the F.O.R. Community Center, 20450 CR 510-B, Holiday Shores Subdivision. Prizes will be awarded for the most unusual items found during the clean up. Another excellent article about the River Clean Up. Thank you so much.